“Making valuable contributions to society” is the corporate philosophy of Yamasa Corporation. Our aim is to conduct a fair and wholesome business by continuing to provide safe products, support to the community, customer care, and environmental conservation with topmost integrity. When viewing various environmental impacts that accompany our corporate activities, we respond by making decisions that are best to preserve the environment. Environmental issues frequently occur in daily corporate activities and the choices that companies make reflect the awareness and attitude of the corporation and their employees, thus affecting the rest of society. We the Yamasa Corporation recognizes that corporate activities must work harmonious with the environment. We pay close attention to conserving the environment and work together to proactively reduce negative impacts to the environment. Wastewater from the factory is cleansed in the “Wastewater Treatment System” before it is released to the sewers and rivers. We strive to keep wastewater quality under our own standard. In order to prevent air pollution caused by smoke and exhaust gas emitted from combustion facilities such as boilers, we strive for appropriate operation management, and conduct periodic inspection, maintenance, and smoke analysis. We frequently conduct noise pollution tests on the boundaries of our premises so as not to disturb those living nearby. 2)DEVELOP PRODUCTS WITH CONSIDERATION FOR THE ENVIRONMENT. – Seek methods to reduce weight and recycle our product’s packaging and strive to use returnable containers that can be used repeatedly. – For easier sorting and recycling, we use caps that are easy to remove from PET bottles and jars. – Reducing container packaging that is disposed after use. 3) WORKING ON THE EXECUTIVE USE AND REUSE OF RESOURCES. – At Yamasa Corporation, we separate industrial waste and endeavor to reduce and recycle as much as possible. –“Pressed cake” (Moromi leftover residue after the Moromi is pressed) is not thrown away but given as cattle feed. – Excess “Soy sauce oil” comes from soybeans during the process of making soy sauce is used as boiler fuel. – The bonito flakes and the Kombu leftovers from the process of making our Dashi are used as cattle feed and fertilizers. 4) WORK TOWARDS PACKAGING RECYCLING. – We separate and recycle packing materials used in delivering raw materials and packaging materials. – Based on the Containers and Packaging Recycling Law, we conclude a recycling consignment contract and support the recycling system. 5)PROMOTE GREEN PROCUREMENT AND PREFERENTIALLY PURCHASE MATERIALS WITH LESS IMPACT ON THE ENVIRONMENT. –We strive to use environmentally friendly stationary items as well as uniforms that are recyclable. 6) WORK TO REDUCE CO2EMISSIONS FROM THE FACTORY. 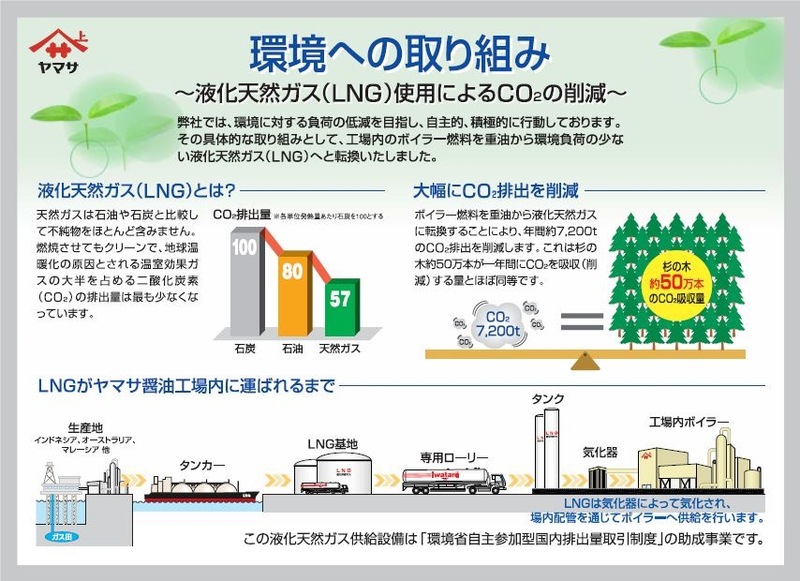 – In order to reduce CO2 emissions, we switched most of the boiler fuel from Type-A heavy oil to LNG. 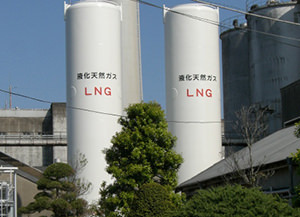 LNG boilers have been in use since 2009. – We hold study sessions to raise environmental awareness within the office. 8) Guard against the summer heat with a green curtain. 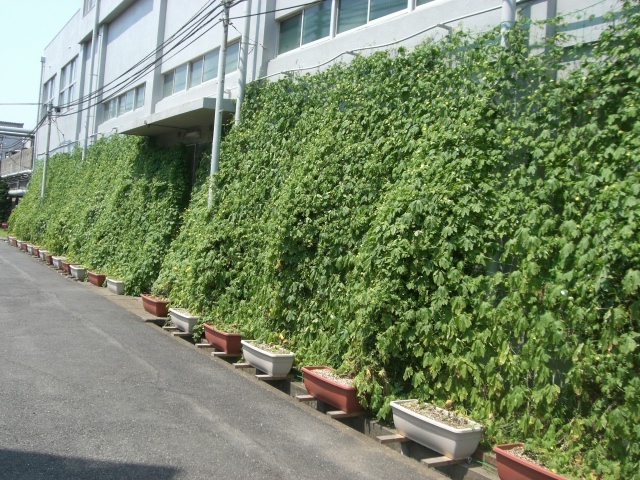 – We grow a green curtain of goya outside our office building, and feel cool and refreshed in the summer heat. – We support food banks such as Second Harvest Japan and Food Bank Chiba by periodically providing them with our soy sauce and tsuyu products. – We clean the roads around the factory, remove trash from parks, and engage in activities that beautify the community. 3) VISIT AND GIVE CLASSES AT ELEMENTARY SCHOOLS. 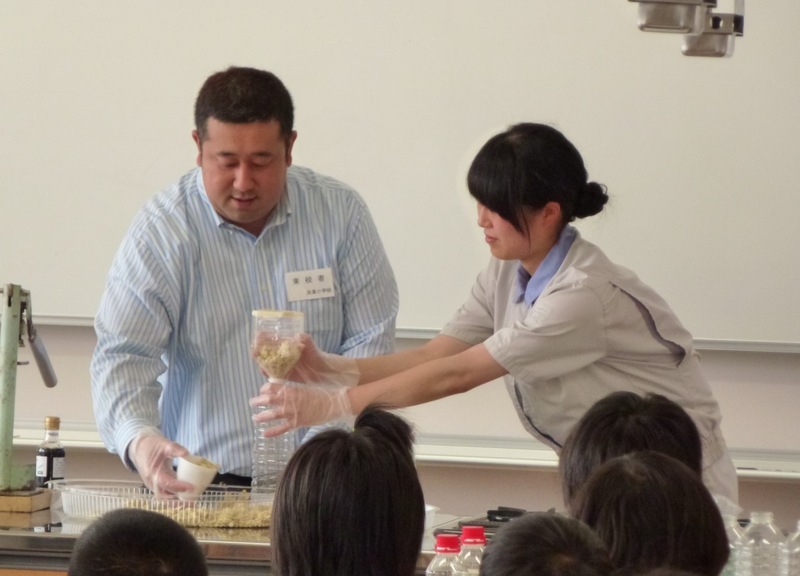 – We visit elementary schools in Choshi and offer actual soy sauce manufacturing experience, as well as providing dietary education. We periodically provide them our soy sauce and tsuyu products as well.